A Gruyere visit has always been high on my box-to be-ticked list especially because an acquaintance of ours, Jean-Claude, comes from this canton and has a bristling pride in its beauty and its cheese. ​One afternoon as we pottered around Lausanne's outskirts, we happened upon a Gruyere sign and said,' why not?' Well, the place was a massive surprise going way beyond Jean Claude's triumphal cheering. Glorious green valley's encased in a jewel box of snowy mountains. As we wandered up the valley, we found ourselves approaching a hill top medieval town with its huge fortified Chateau and a thousand year history to whisper to us. We parked half way up and sauntered into the past, an old pave' square with time frozen vintage houses and shops all around. And there, prominently on top of the hill is the 13th century castle that was the residence of the Counts of Gruyere. The last of these counts unhappily declared himself bankrupt in 1554 and the property was repossessed by the creditors, the towns of Fribourg and Berne. 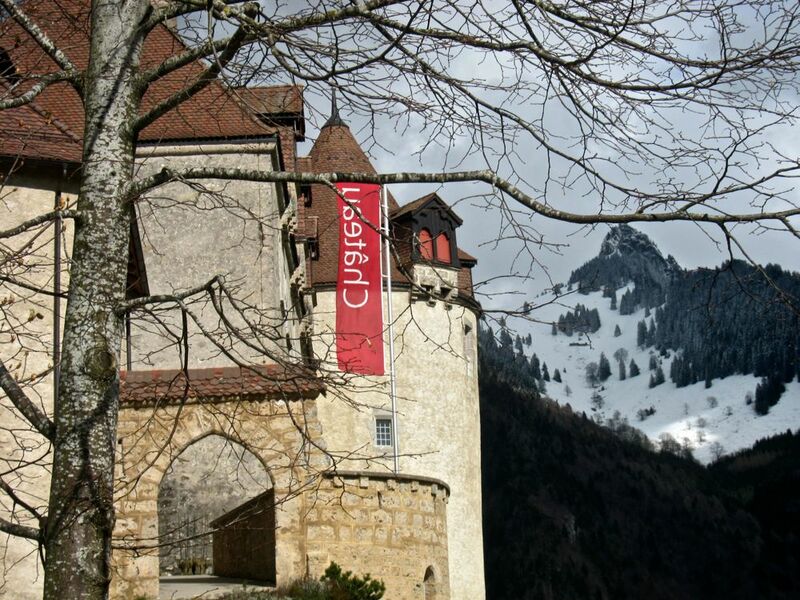 In 1938, the Swiss State of Fribourg bought the castle and made it into a museum with history's paraphernalia and a first class video of the history of the castle. Not too much on the bankrupt Count though! The tour of the Castle will bring you through eight centuries of architecture and history and the paintings are a decent collection of lesser know lads from the South (Italy). Entrance fee for adult is 10 Swiss francs and less for seniors and children. Without these fees, this living history can't exist (outside of the Middle East) so it really is a tiny contribution to our own legacy. 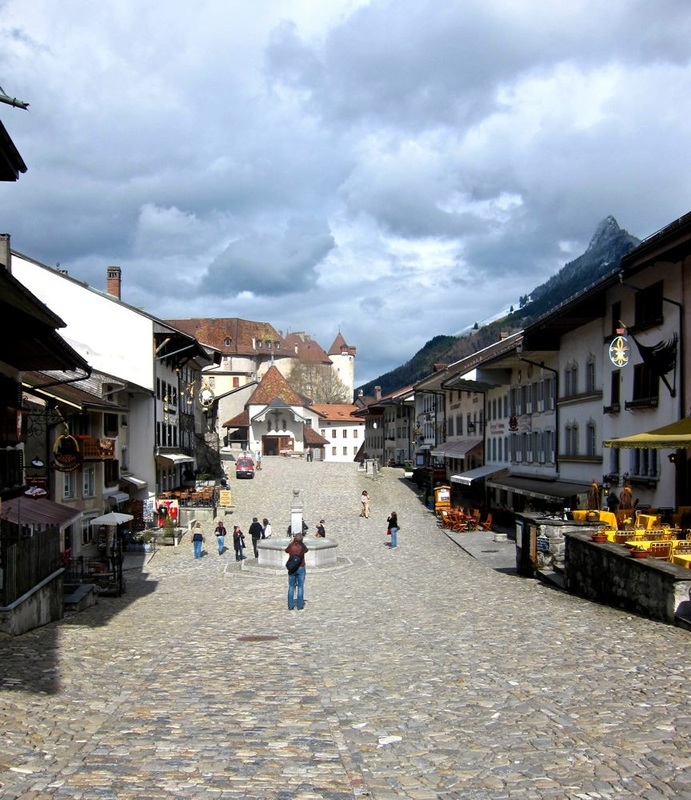 Gruyere is a small town with its population doubling in the last 100 years to about 1700 people. 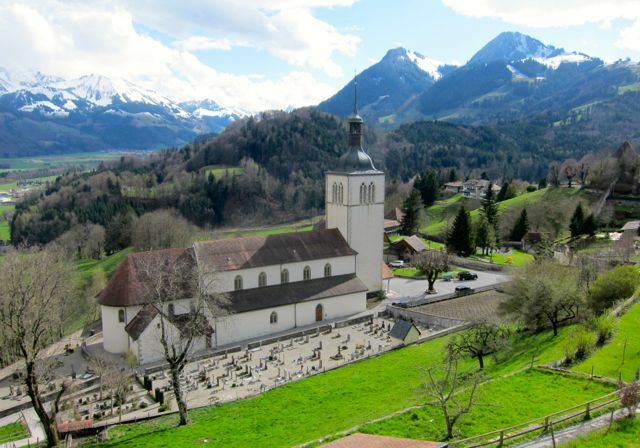 It is about 35 kms from Fribourg and can be reached through the A12 motorway exiting at Bulle. The drive is fantastic and really underlines how important it is to rent a car and wander about with a good map and GPS. While in the town, you must sample their famous double cream. Have a coffee in one of the restaurants or better still have a fondue or raclette and sample a typical Swiss dish with the best Gruyere and Fribourg local cheeses. Coming down from our climb to the castle, quite manageable by the mid sixties brigade, we enjoyed the shops, houses and restaurants lining the path. Some of the local crafts are very interesting. I found a wood sculptured cow with my name, a very interesting find which made me feel special. The cow, however, looked dubious! Another interesting find is the H.R. 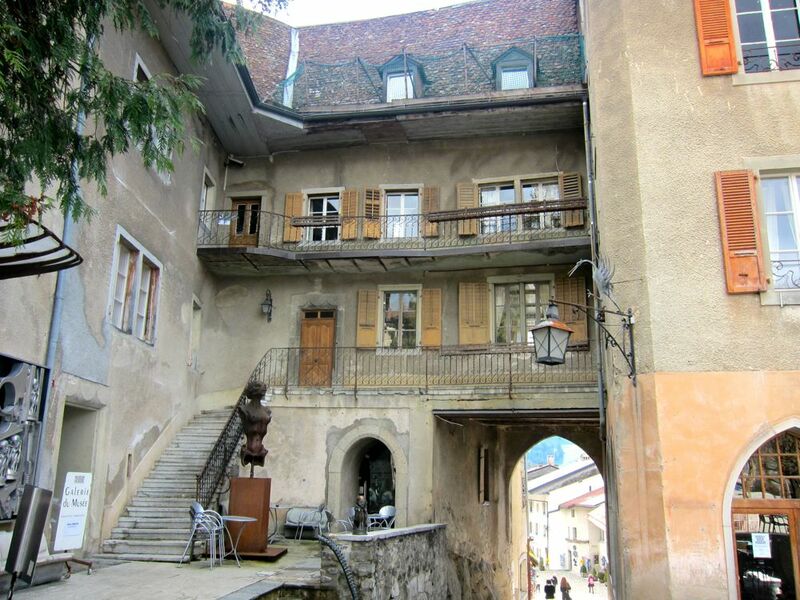 Giger Museum. I looked at this name for some time as something rings a bell. Well, this is the laddy who did the drawing for the creature in the movie, "The Alien". This museum houses his drawings and paintings as well as sculptures of assorted alien creatures. His art captured our imagination, maybe more so because it was a bit alien to us. If you are lucky, you will also be entertained by locals performing vignettes of ancient village life and you really have a feeling of the past. Most of us associate Gruyere with cheese as this savory product is known all over the world. But Gruyere comes from the French word "grue" meaning crane and you see the crane symbol everywhere. However, the big draw is the cheese which is central to a sheep/cow/goat based agriculture where shipping cheese was, and still is much easier than moving milk. It is one of the cheeses valued for baking as it does not overpower the other ingredients. Of course, it is the best cheese to use for fondue. In this village square, there are several restaurants offering Gruyere's traditional fare. In the right setting, food tastes more exotic. We, of course, visited the La Maison du Gruyere to get some of this sweet but slightly salty, nutty cheese and we were invited in to watch the master cheese makers produce up to 48 wheels of Gruyere AOC (Appelation d"Origine Controlee). AOC is the stamp given to products made only by traditional methods in a given area. This is your stamp of authenticity so look for this when buying Swiss products. Other French cheeses such as Comte and Beaufort also tried to use the name Gruyeres but Switzerland in 2001 threatened to invade (joke only)but they really take these things seriously. Finally, the Swiss got the AOC to hammer the French. It seems everyday, you can enjoy watching this cheese making as farmers bring their milk twice a day and between 9-2:30, cheese is made 3-4 times. This place is also a restaurant so you can enjoy more traditional Swiss cheese favorites. Nearby is Mt. Moleson where you can hike or take the cable car to the summit. What we did was continued our long coast down hill through the snowy mountains, past ski country, past Aigle, to Lake Leman and home to Grand Vaux. What a fantastic day and if you are a day tripper, Switzerland is made for you. Magic around every corner. The pathways through these tiny villages in the valleys of Gruyere are very inviting. It makes one want to go for a hike with a sumptuous picnic to follow of the Gruyere gourmet products. Before you leave, take a moment to share this in your favourite social media. ​And, don't forget to leave your comments below. Thanks for your visit.